Jamila Millar Velasco has been living and working in Dubai since 2014. Did you know that, as of 2016, over 600,000 Filipinos are working and living in the UAE? For a lot of Filipinos, the UAE, specifically Dubai, is the ~dream~ destination for when we aspire to work abroad. 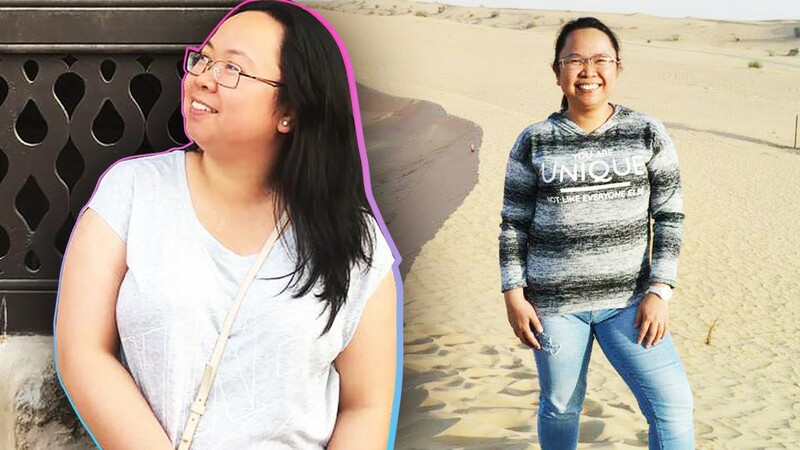 One Pinay tells us how exactly she landed a job there: Jamila Millar Velasco moved to Dubai in 2014. For a living, she writes security alerts for clients in high-risk environments in the Middle East, Asia, and Africa. When did you move to Dubai? My husband and I moved to Dubai on 15 August 2014. My mom already works in Dubai so she sponsored our month-long tourist visas. We extended our visa for another month. I landed my job on October 6, and my husband was hired a week earlier. What made you decide to apply for a job in Dubai? After graduation, I worked as a researcher at a government-run, quasi-military school in Zambales for three years. It was really difficult because I grew up in Bulacan so every Friday and Sunday, I traveled for six hours between Bulacan and Zambales. I researched, edited post-grad thesis papers, co-authored a textbook, co-edited a manual, and only earned P8,000 to P10,000 a month. Sobrang kayod talaga. I lost self-confidence because my friends were all creating career paths in Manila and already supporting their families. So my then-boyfriend and I decided to get married right away, expedited our papers, and sent it to my mom for processing. How did you land a full-time job there? In Dubai, hindi uso ‘yung walk-in applications. Everything is done online. I updated my CV and uploaded it to online job sites. I also updated my LinkedIn profile! A month passed and I only received a couple of calls. Napapraning na ako no’n, because my husband had a very full schedule—one interview after another. Samantalang ako, tambay sa bahay. Finally, I received an email saying I was shortlisted for a position called Intelligence Researcher. They gave me a writing test with a 24-hour deadline. They provided two links to two security-related news stories for Yemen and Nigeria and the task was to write a five-sentence security alert. That’s exactly what I was doing when I interned for MBC’s DZRH. I answered the email right away and submitted the writing tests. An American guy called me and scheduled me for an interview that afternoon. During the interview, they showed me a news website for Afghanistan and asked if I could identify security-related news and write two security alerts in 45 minutes. I finished in 30 minutes. They were really surprised and excited to see what more I could offer the company. I signed and accepted their offer right then and there. I was the first Filipino to be hired in our department, and now, almost four years later, they’ve hired nine other Pinoys for the same position. They are looking to hire three more in 2018. During my time, they didn’t interview anyone else—it was a quick hiring process. That’s why I’m so surprised when I found out how hard it was for the people who were hired after me. To be honest, it’s really competitive;they only consider eight people per batch—and that’s after they filter through hundreds of CVs. Funny thing is, wala silang in-interview na iba pang candidates during my time. When I applied, it was a one-day process. I spent six dirhams (around P82) on the metro fare. But if I compute the visa fee and the basic needs when I was still jobless, I probably spent around 4,000 dirhams (or P55,000). Tell us about your job in detail. I write security alerts for our clients in high-risk environments in the Middle East, Asia, and Africa. When I say security alerts, that includes high-impact incidents like air strikes, armed clashes, shelling, complex attacks, IEDs, targeted killings, kidnappings, maritime attacks and other small incidents like route obstruction, demonstration, land/livestock conflicts, road accidents, etc. We upload them on our web-based platform; our clients can view them on a map and produce or export analytics out of it. Every time we upload an incident on the platform, our subscribed clients will instantly receive it through SMS and email. Hindi na nila kailangan mag-check ng newspaper tomorrow para malaman kung anong nangyari sa area of work nila today. We also collate those security alerts in a single Fast Facts report, so they can review the alerts at the end of the day. We provide analysis and risk assessment for our clients at least once a week (per country). We cover almost 20 countries at the moment, and there are plans to open services for a few more this year, including the Philippines. My basic salary is 6,000 dirhams (roughly P82,000) per month. I also receive a quarterly bonus when our team reaches the sales quota—and that’s besides the Christmas and year-end bonuses. The company I work for can be pretty generous. What other perks or benefits does your job give you? I’m allowed to spend a month-long vacation anywhere. Our company pays for two round-trip tickets per employee. My schedule is also pretty flexibe. Since I work in the security field, we don’t have holiday vacations, which is when there are more attacks in high-risk countries. So we have to be available 365 days a year. Our shifts are staggered: One team works from Monday to Friday, and another team works from Saturday to Thursday. There’s also a floating shift (Wednesday to Monday) to cover for someone who’s on vacation or a business trip. I report to the office from Monday to Thursday and work from home on Fridays. But since I just gave birth, my work time is reduced an hour a day for 18 months (and that’s after my maternity leave). My maternity leave was 45 days (with pay), but there’s an option of extending it to 100 days (without pay). The company also provides us gadgets so we can do our job well. I have an office laptop, and at-home laptop, and a mobile phone with a postpaid sim card that’s paid for. The most challenging part right now is balancing my work and my mommy duties, especially when I work from home. I really needed to adjust. I also rarely use my sick leaves because, like I said, we can always work from home. It’s hard to leave the country I’m in charge of unattended because so many things can happen in just one day. And because we’re available 365 days a year, even if I’m off-duty, I’m on-call and always alert.